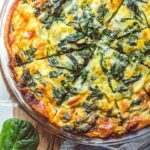 This super creamy, cheesy keto crustless quiche uses bacon as the crust, that's right! The best low carb way to start your day! Preheat the oven to 375 F and line a rimmed baking sheet with parchment paper. Lay 5 slices of bacon side-by-side on prepared baking sheet. I used 10 pieces of bacon for the weave, and baked 2 additional pieces on the pan — this will be the “sides” of the crust. Bake the bacon for 15 minutes, we want it to be almost completely cooked but still pliable. Carefully drain the bacon grease from the pan and slide the bacon onto a paper towel lined plate. Place paper towels on top to absorb grease from both sides. Place a pie pan on top of the weaved bacon (setting the additional slices aside), and grab the bottom of the paper towel lined to flip the bacon into the pie pan. Adjust bacon as needed, and place the slices along the edge of the pie pan. In a large skillet over medium, heat the vegetable oil until shimmering. Add chopped onions and 1 teaspoon of salt. Cook until translucent, about 10-12 minutes. Add garlic and stir to combine. Cook for about 1 minute, or until garlic is fragrant. Add spinach and toss everything together. Cook until spinach has released its water, about 6-8 minutes. Place veggies on a paper towel lined plate to absorb excess water. In a large bowl, whisk together eggs, heavy cream, and remaining salt. Stir in mozzarella and veggies. Pour egg combo over the bacon crust. Bake quiche in the oven for 40-45 minutes, you’ll know the quiche is done when the edges begin to brown and the center is firm. Allow the quiche to cool for 10 minutes before slicing and enjoy! To save some time: cook the veggies while the bacon is in the oven. To save some carbs: skip the onion, or use less.